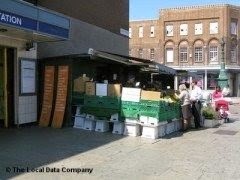 Stand Up For Stockwell: Save Stockwell's local businesses! Your Stockwell councillors are running a campaign to support local businesses at Stockwell tube station which could be under threat under Transport for London’s plans for the station. Your councillors have been in touch with the florist and fruit and veg stall and the independent coffee shop ‘Tintos’ which operate from the stations. Both could potentially close without your support. Tintos were hoping to move into a bigger site in the station, but have been told they have lost the bid and need to vacate their current premises. The fruit and veg stall and florist have been told they need to move to a smaller site around the corner which would reduce their stall and mean they could employ 1 person. We wanted the florist / fruit and veg stall to be protected or a similar size patch found so they can continue their much loved business. Cllr Alex Bigham met with Brenda who works on the stall this weekend and with Oliver from Tinto’s coffee. Generally we want to protect and support local business and give opportunities for more local employment (the new Sainsburys which will replace Jack’s will create more local jobs). We’ve contacted TfL to raise our concerns and request an urgent meeting to discuss. More broadly, the next phase of the Stockwell gyratory plans will provide other benefits - more public space for pedestrians and better access to the refurbished war memorial; a safer route for cyclists plus other improvements to the street scene. We'll endeavour to keep you updated as things progress. But we need your support - so pls sign the petition. All updates about upcoming event T20 World Cup 2016. World T20 Today Match Live Live Commantory, Live Streaming, Updates, Ball by Ball Score and T20 Schedule, team squard, Team kits and fixtures. You can share Latest Hindi status for whatsapp.